Technically minded players love science fiction detail and being one of those roleplayers, I love it too. Giving tech-minded players technology detail gives them more choice to delve into. When the spacecraft is broken and can't light jump to Arcturus, rather than "it's the doohicky" that's broken, you can say that the Energy Well is broken. If the player is interested, they can then offer a solution and earn roleplaying points or a bonus to the Skill roll. "How Icar stuff works" was defined around 1999 in Word document files. I've recently returned to them and my blood curdled in horror. By 2005, I had converted them into 55 html pages but printing was a nightmare. Imagine printing 55 separate html pages. I am in the process of recreating the whole lot in a PDF (along with all the other unfinished PDFs), starting from the first principle science and building. I thought I could leave that on a back burner but my hand was called recently when a new (technically minded) player volunteered to be the spacecraft engineer and (reasonably so) wanted a diagram. The diagram and text below are from the unfinished technology index, I hope you find it useful. I aim to blog some of the other sections as I edit them. Spacecraft share many of the properties of other vehicles. They have an energy web for transferring power, provided by the main generators. They have artificial intelligence, Grav engines, Grav plates an so on. Most importantly, spacecraft include the means to travel between stars. This is the different between a Heavy Grav and a Spacecraft. If your Light Jump Engine is broken what you have is a Heavy Grav, not a spacecraft! Below is a diagram of all the main systems on a modern spacecraft (click for a larger image). 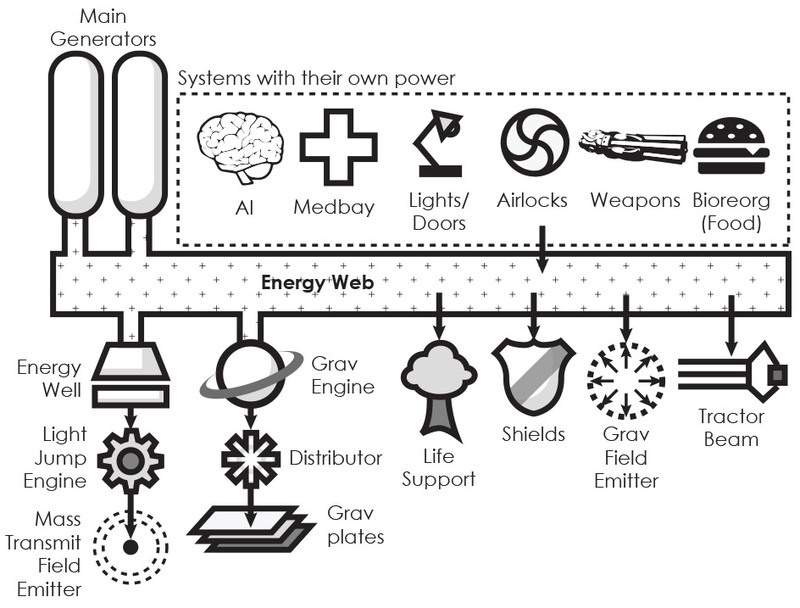 Woven into every strut, hull plate and floor of a spacecraft is the energy web. A mesh of cables of varying size but the vast majority are the size of hair. Blowing a huge hole in the outer hull not black out an area of the spacecraft, only destroy the systems it encompasses. The web can be used to power anything, taking feeds off it is easy. The energy web is also the main communication system, tiny intelligent agents whiz around the web communicating almost instantly with every other system on-board. In emergencies, the web can be used as storage and itself can be depleted to drive systems. A depleted energy web takes roughly 15 seconds (5 turns) to bring back to full power. Power is inexpensive and many systems (in the dotted box) have their own generators. The large generators that are used to power the most hungry systems are simply referred to as the Main Generators. A spacecraft is usually equipped with twice the number of main generators needed to perform a faster-than-light light jump. These three separate systems are required to travel great distances faster than the speed of light. To perform a Light Jump, the main generators charge up the Energy Well (which takes ten minutes). The Jump Engine then orchestrates all that raw energy into a particular shape and dumps it all at once into the Mass Transmission Field Emitter (MTF Emitter). The MTF Emitter creates a bubble around the outside of the spacecraft, which moves the mass of everything inside it into the second medium. The Grav Engine then performs a tiny push down the feint gravity gradient of the star you're travelling to and the spacecraft moves through the intervening space in just a few seconds. Once the jump is complete, the mass transmission energy field that is attached the spacecraft (and everything in it) takes an hour to dissipate. A spacecraft cannot emit another Light Jump field until the previous one has dissipated (roughly an hour). Spacecraft usually keep the Energy Well charged. Charged Energy Wells are very easy to detect, as are spacecraft waiting for mass transmission fields to dissipate. When the spacecraft jumps, any ions in the space it travels through begin spinning in a very specific direction. This is called an ion trail and can be used to track spacecraft. Most spacecraft can route power from the Energy Well back into the Energy Web but with some risk as the Energy Well holds a great deal more than the web! These systems work together to move the spacecraft around wherever there is any kind of gravity. The Grav engine is given a command to move and it creates a special energy pattern that it gives to the distributor, which in turn feeds the Grav Plates. The Grav Plates turn the energy pattern into a force. Grav Plates powered without a working Grav Engine will hold position relative to the nearest large gravitational source. Grav Plates without power at all will not produce any force. Life Support is an umbrella term for thousands of tiny gas bioreoganisers spread around the spacecraft. The bioreorgnaisers take in stale air and produce fresh air, usually with the fresh scent choice of the Captain. Used for protection against incoming projectiles, asteroids or extreme radiation. Most spacecraft carry multiple shield generators. Only one generator can be active at a time. If a shield takes a large amount of damage (or a single pulse laser round), it will take 3 seconds to disappear, at which point the next shield generator will spark into life. Once a shield is taken down, all that energy is dissipated back into the second medium by the shield generator (which will appear offline). Once finished (usually around 10 minutes), the shield generator comes back online. Shield generators are synonymous with "Shields". The Grav Field Emitter creates thousands of artificial gravity bubble that can be used for a number of uses. The most common is giving gravity to all personnel in the spacecraft so that there is a common "up". Other uses include stopping atmosphere from leaking out through hull breeches, allowing engineers to walk on the surface of spacecraft and changing the gravity in any part of the spacecraft for comfort. A way of pulling objects toward the spacecraft. All tractor beams have a maximum range and they work by setting up an external gravity field around the target. The Artificial Intelligence (AI) orchestrates the systems on-board. Each system has its own intelligence that is a slave to the spacecraft intelligence. The spacecraft AI can answer questions, help with simple tasks and control low-AI power Automatons that have it has been handed control of. Some spacecraft have an Avatar, a humanoid Automaton that represents the spacecraft itself. A medical facility that can cater for humans and bionics as standard (required by Imperial law). The size is proportional to the crew. Many spacecraft come with a medically trained automaton but it is not equipped as standard. These all take power from their own generators and all doors have a mechanical alternative to open them. Opening a door mechanically is slow! Weapons are mounted in clusters in divots in the hull. They are usually 20 gauge pulse lasers. Ammunition must be replenished manually. These use raw energy to turn organic blocks (called biomatter) into any kind of food depending on the Gaia entities loaded into the bioreorganiser. The more exotic the food, the more biomatter required. A good rule of thumb is that 1kg of biomatter can feed a human for 1 month and is the shape and size of a Rubik cube. Icar was written and designed by Rob Lang (roblang@icar.co.uk), who also writes The Free RPG Blog and is an administrator at 1KM1KT (a free RPG community). Icar is released under the Creative Commons Attribution-NonCommercial-ShareAlike 3.0 Unported (CC BY-NC-SA 3.0) license.